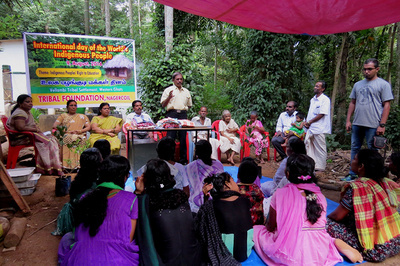 The tribal people of Vellambi Tribal Settlement celebrated the International Day of the World's Indigenous People sponsored by the Tribal foundation on August 9. Delivering the keynote address, S Davidson, environmental educator said that this year’s theme is devoted to the right to education. The right of indigenous peoples to education is protected by the UN Declaration on the Rights of Indigenous Peoples, which in Article 14 states that “Indigenous peoples have the right to establish and control their educational systems and institutions providing education in their own languages, in a manner appropriate to their cultural methods of teaching and learning.” In spite of the provision, the right to education has not been fully realized for most indigenous peoples, and a critical education gap exists between indigenous peoples and the general population. He quoted the statement of the Secretary-General, Ban Ki-moon that indigenous peoples face a wide range of challenges including systematic discrimination, denial of their land and territorial rights and inadequate access to essential services. Indigenous peoples regularly face stigmatization of their cultural identity and lack of respect and recognition for their heritage and values, including in textbooks and other educational materials. Their marginalization is often compounded by language barriers. Instruction is mainly in the national language, with little or no instruction in, or recognition of, indigenous languages. He pointed out that the Foundation helps the tribal children in education with notebooks, uniforms, education equipment, rain coats and allied necessities. The objective to promote their education is that they get married at an early age of 13 or 14 at the attainment of puberty. Early marriage results in lot of abortions and infant mortality. The literacy rate of woman of this tribal community is very low. To avoid this, they education program is launched by the Foundation. Elderly tribal people were honoured. Horticulture saplings were gifted. M Mathavan Kaani, M Sankaran Kaani, Mundathi Kanni attended the function.